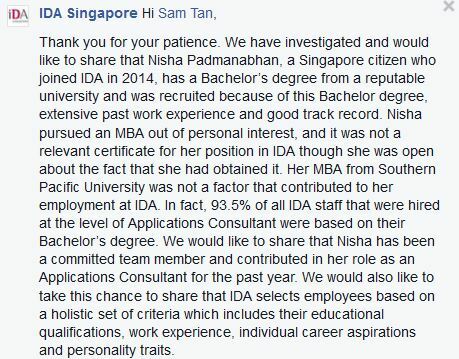 A month ago, an IDA staff was discovered to have obtained her MBA from a degree mill. IDA defended their choice to hire her, saying that she had a Bachelor’s degree from a reputable university. This was IDA’s response from Tremeritus. Needless to say, the response to this was less than favourable. 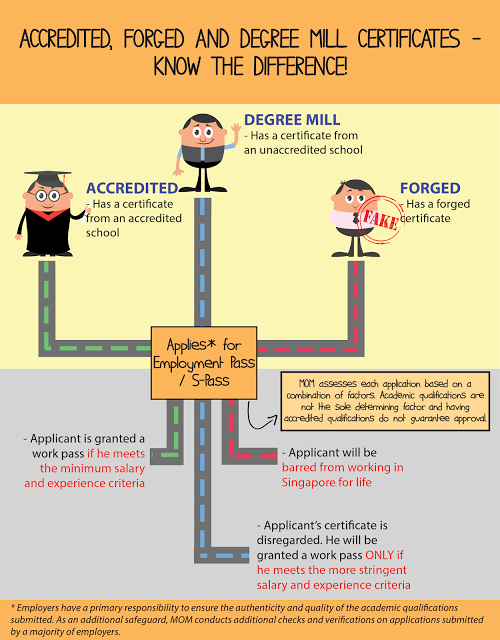 In response to this saga, the Ministry of Manpower has released an infographic to explain how IDA’s stand made perfect sense. There are quite a few questions that will spring out from this. 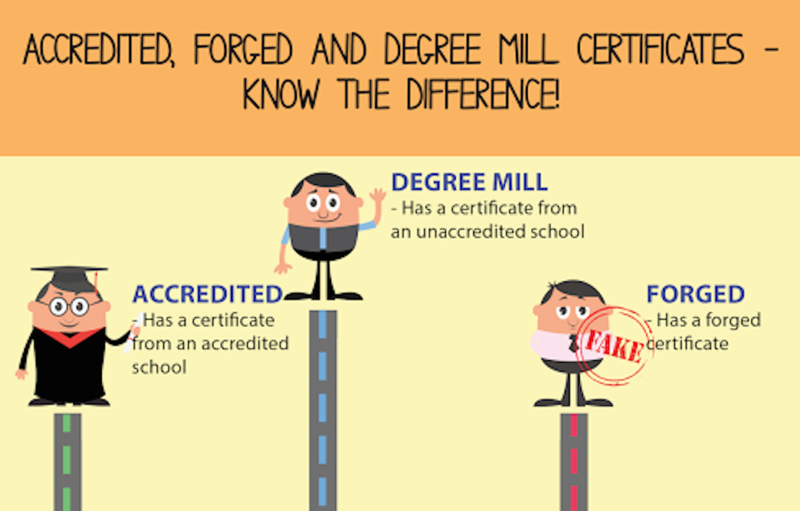 Though we now know the MOM’s stand on the difference between forged certificates and degree mill certificates, the infographic equates a degree mill certificate to an unaccredited certificate, and there isn’t a list of accredited universities available for people to check if they fall within that unaccredited category. Mothership.sg asked the same question, to which MOM replied on Facebook that there are a few ways to define the term “degree mill” — the difference in consequence ranges from a disregard of said degree and a more stringent criteria imposed on the applicant, to a maximum fine of $20,000 and/or jail term up to 2 years and a bar from working in Singapore for life. So what does all this mean? 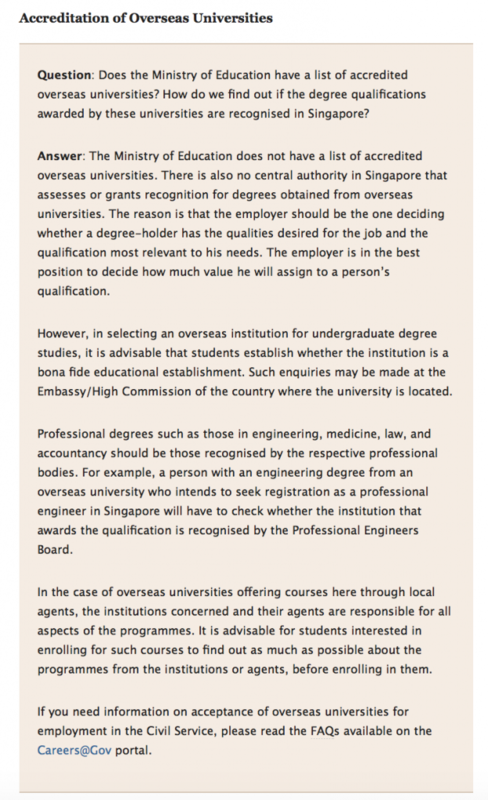 Firstly, there is no clear distinction between a degree mill and an unaccredited university, but obviously the intention to pay your way to a degree instead of working for it is clearly a bad move and will be penalised severely, so best not to go for anything close to an easy degree. 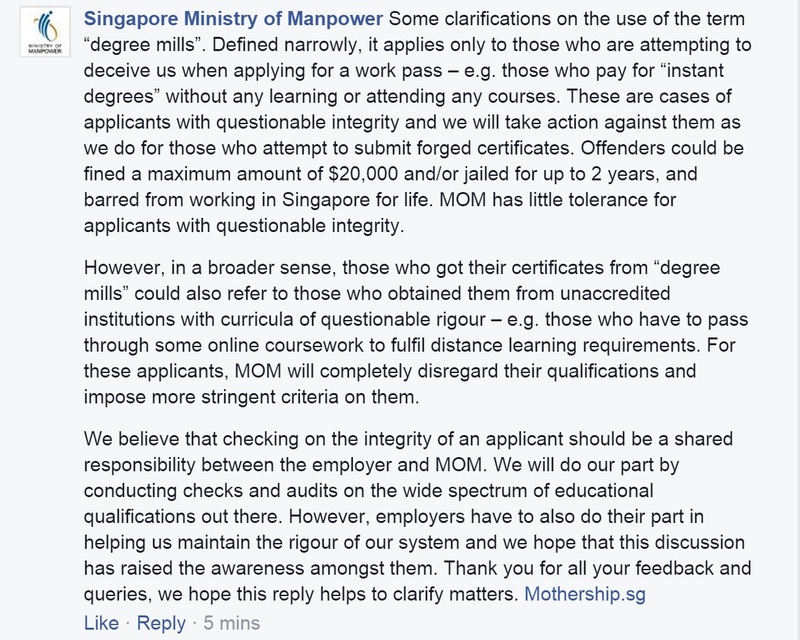 Secondly, while the Ministry of Manpower still performs routine checks on employers, it’s still up to the employer whether to hire the person or not. In the IDA situation, that means that the IDA had every right to hire someone with a degree mill MBA, as long as she is judged by her other qualities. And lastly, there’s a large grey area in the middle that isn’t defined, but don’t worry about that because MOM promises to look at those situations on a case by case basis. That’s a big headache for a simple infographic.